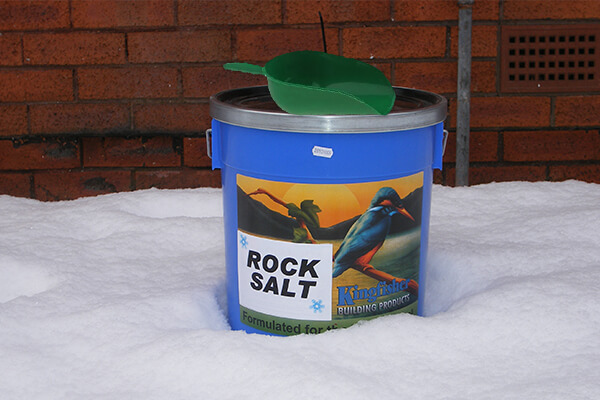 No messy split bags - Kingfisher Rock Salt grit is supplied in a tough reusable plastic bucket with a scoop. Easy to use, easy to store and less waste! Kingfisher Rock Salt is a unique fine grit, specially coated in a powerful de-icing salt. Kingfisher Rock Salt grit offers the ultimate solution to loss of traction and grip on car parks and footpaths during icy or snowy conditions. Kingfisher Rock Salt grit will continue working until it is either washed or swept away. This bucket will treat 125-150 sq m depending on spreading method.